Earlier this summer, we visited the Luray Caverns. Near the end of the tour they have what they call the "Stalacpipe Organ." 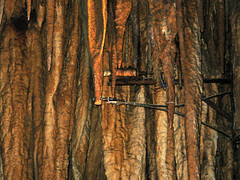 They have hooked up hammers like the one in this picture to stalactites. Each one makes a different note so they can play music. It was kind of cool, but very confusing. Throughout the tour we were warned not to touch anything but here they were hitting the formations, some of which were even cut to create the needed notes.